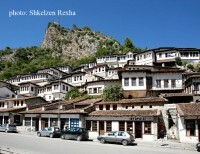 Berat is a White Bethlehem. Watched from far, it seems a cartoon city, as only Walt Disney can build one, placing with poetry its geometry. Houses, all white with green blinds are one above the other, in the race who arrives first at the top of a rock burned from the sun, which has been divided in two peaces from strong currents of Osumi ..... Indro Montaneli ( 1939). 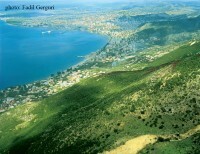 Saranda, the nymph of the Albanian coast. Saranda, the small town that can be called “The getaway to the Southern Albania” is situated between high mountains and the blue Ionian Sea. Built on the Ionian seashore, facing the greek island of Corfu, Saranda injoyes a typical mediterranean cilmate, wich is gentle and characterized by optimal seawater temperature. The favorable geografic position and climate, make Saranda one of the most appealing touristic destination in Albania and not only for these reasons but also for its historic and archeologic values. Shkodra is one of the largest and most important cities of Albania and lies in the northwest part of the country. It is also the biggest trade center of the North. Being one of the most ancient cities too, was established in the last millennium B.C. as the capital city of the Illyrian tribe of the Labeates. It was a very developed economic centre, under the leading of King Agron and Queen Teuta. During that period, the city lied from Shkodra Lake, till in the Kotorri Bay.Visiting Shkodra means to give to onself the privilege to touch the ancient history of Albania, its culture which comes from the deep times, its geography, rare and marvellous, the fine humor, the charcateristic hospitality and the funny people. Being one of the most ancient cities in Albania, Shkodra has given to its country, many personalities of history and culture, during all the periods. Shkodra is called very early, the cradle of the culture. Tirana is the largest city of Albania and its capital concurrently. A roaring city full of life, Tirana has collected in her bosom almost of 40% of the population living in Albania, who see the capital as a better opportunity for life and their future. Tirana is also the main administrative center, where are located almost all state institutions such as Presidency, Prime Ministry, the Albanian Parliament, the Supreme Court, the ministries and other state institutions of the second and third level. In Tirana are also located all diplomatic representations of states with which Albania has diplomatic relations, and the headquarters of the political institutions of Europe. Tirana is the largest center of education in the country, with a University Corpus involving all branches of education, but also with a number of private universities, which operate in recent years. Bukuria e Alpeve Shqiptare nën frymëzimin e "Majave të Ballkanit"
Copyright © 2019 AlbanianTravel.info. All Rights Reserved.